Part of an occasional series exploring North America’s parks. “Mum, can I come with you?” Jilly asked in her sweetest sing-songy voice when she saw me grab my car keys. The tantrum was still echoing down the hall, but forgiveness comes as quickly as temper. Jilly and I were sick and had spent two days inside the house. She wasn’t the only one who’d had a tantrum that day; we needed to get out of the house or break down in tears. So we gathered all the hats and mittens, stopped to pick up Grandma and headed west toward the Ontario border. 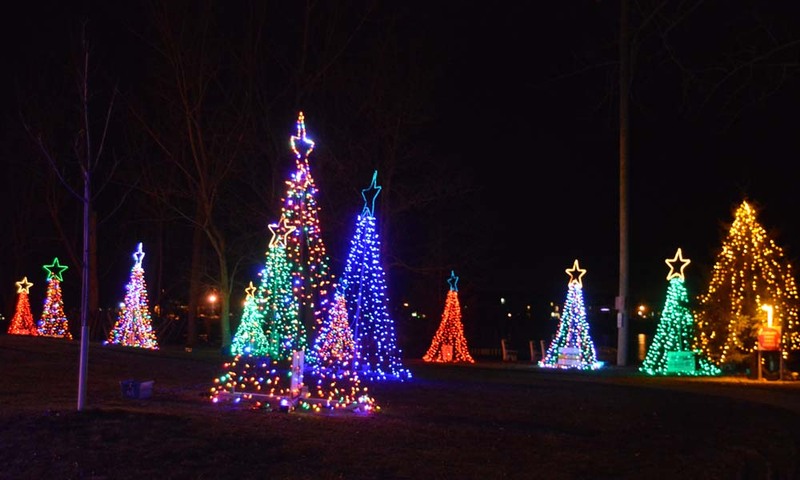 Alexandria’s Festival of Lights is a showcase for community involvement. It was founded in 2006, when an enterprising citizen drafted people from the neighbourhood to create 22 light sculptures. It nearly came to a dramatic end that first year when an ice storm struck the day before the grand opening. The hardy residents banded together to get things back in ship-shape and the festival was inaugurated with a parade. 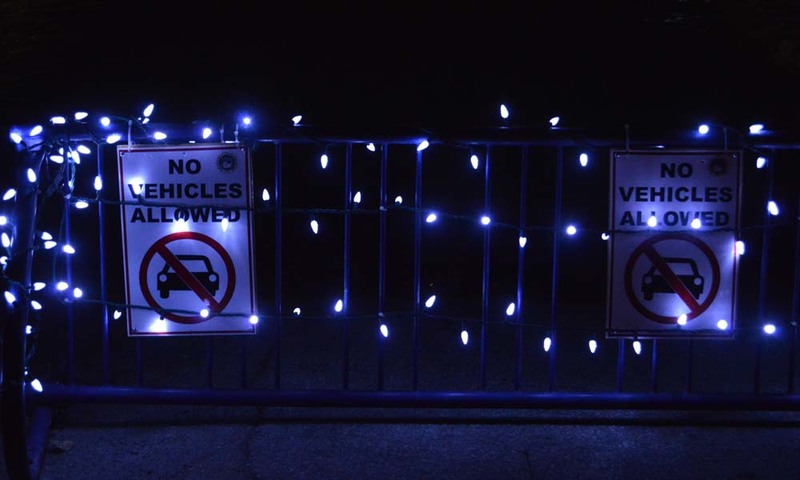 The town of 3,200 people is a little more than 100 kilometres west of Montreal and it takes Christmas seriously. 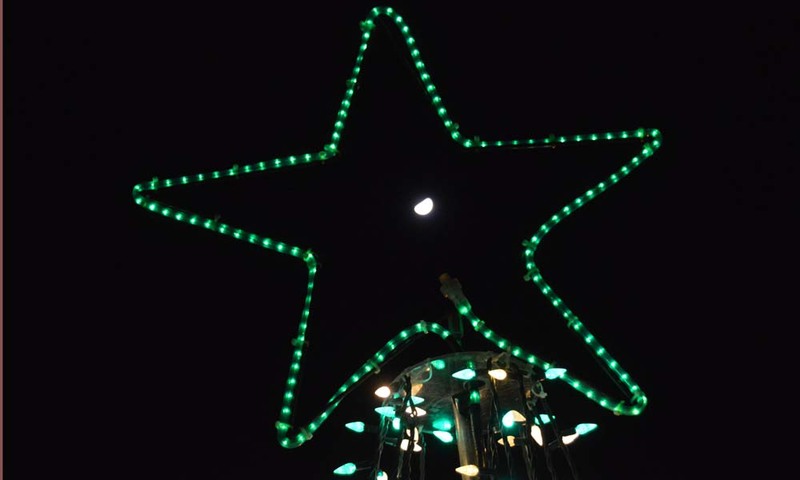 Strings of red lights spell out NOEL above the town sign and Main Street—in fact, dozens on dozens of houses on the way to Main Street—compete with constellations to light up the county. The festival’s website does not display very nicely on mobile, so we weren’t completely sure whether the light show was still going on, or what park it was in. We drove slowly and pointed out every bright reindeer and slightly creepy crèche—like the heavily shadowed one that appeared to have a faceless Mary and Joseph—we saw along the way. We cruised along with our eyes peeled—“There’s a park!” I said happily, but it was just a monument on a hill—until we hit the back end of town and looped around to a gas station. “Turn right at the second traffic light,” the clerk told Melani, though from my spot inside the warm car, her gestures told a much more complicated route. Indeed, we’d missed a step because we somehow ended up at the back end of Island Park. We shrugged, left the car there and snuck in. And by “snuck,” I mean we took five minutes to get all our hats and mittens on and grab the camera and giggle a little bit before slipping through the half-open gate. Such pretty lights! The whole town—and beyond—is represented here, from schools to hardware stores to the pharmacy. A funeral home’s memory tree was especially touching. Along the shore of Mill Pond, a line of trees is reflected on the ice. If your gaze should wander upward, the stars seem to be just another part of the festival. There is free hot chocolate to be had in the little kiosk and a donation box at the entrance to the park. All money raised goes back into the community, for next year’s festival and for improvements to the park like a sound system for the bandstand, the kiosk itself, a security system and lots more. The Christmas season has blown past in a flurry of dinners, and flights to and from home, presents and colds, tree-shopping and tantrum-holding. Here it was quiet, despite us and without much snow to crunch underfoot. This small pause was like the deep sigh one indulges in before rolling up one’s sleeves for the next big thing. 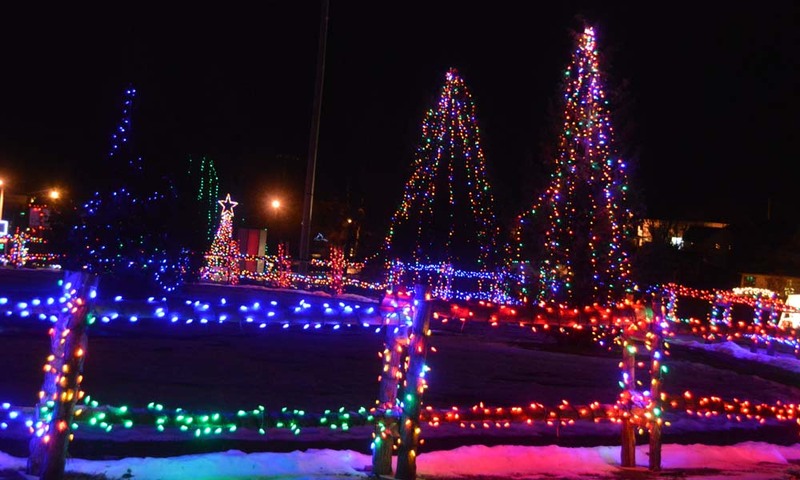 You only have two more days: The festival of lights in Island Park runs from 5 p.m.-10 p.m. till Dec. 31. New Year’s Eve, get there by 6 p.m. for the fireworks celebration.